A little heat, a little sweet, and a lot of rich… this Southwestern Chile Corn Chowder is one of the things I love about autumn! Once, when I was writing a cookbook for a publisher (who later cancelled the contract prior to publishing), an editor remarked with disdain that my food was Southwestern in its flavors and ingredients even when I was making something that was traditionally from another region. Well DUH. It’s what I do. I love the flavors of the Southwest. I love the techniques and sauces of France, the freshness of Italian food but my heart belongs to Texas flavors and ingredients. That’s why in MY kitchen you will find a touch of chipotle in my chocolate mousse, pesto made with cilantro and pecans, and a variety of other fusions that often offend the prestigious palates of would be publishers. Chowder showed up in the first American cookbook in 1800 and was a soup of fish, salt pork, crackers and a side dish of boiled potatoes. It wasn’t until the 1840s that potatoes were actually added to the mix rather than served along side it. Over time chowder evolved differently in different regions according to the local ingredients. Lobster, clams, crab or whatever was abundant locally became the main ingredient in the chowder and was added to the stock, salt pork,potatoes, and butter that made up the rest of the dish. Sorry, I am a homeschool mom. I love information and I love to share it. 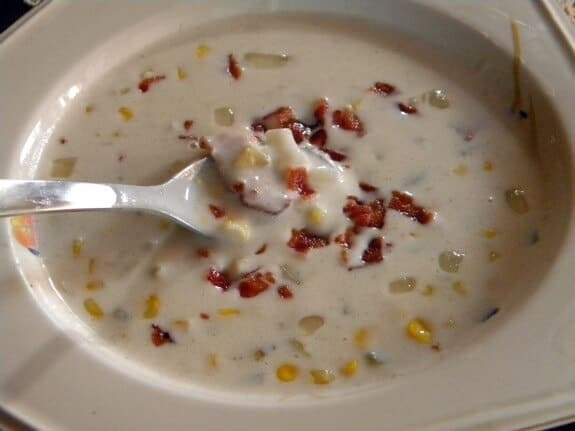 Corn chowder is most often associated with the Midwest. I have serious Midwestern roots and the foods that I grew up with hold a special place in my heart… as long as I can add a Southwestern twist here and there. Corn chowder is a favorite of two of my children. 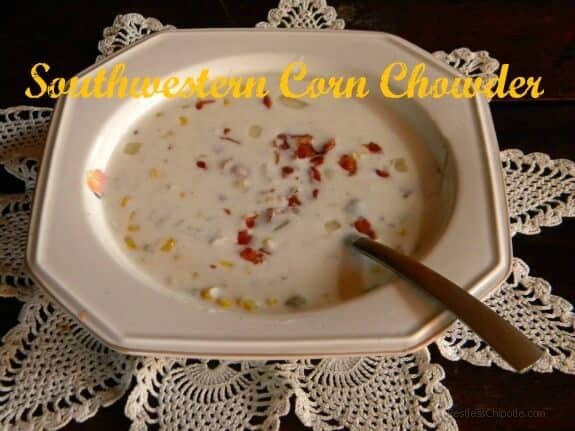 I have made it hundreds of different ways from adding creamed corn along with the milk to substituting sausage for the salt pork but my favorite continues to be this Southwestern Chile Corn Chowder — a little heat, a little sweet, and a lot of rich flavor. It is a hearty, soul warming meal when served with some hot biscuits or cornbread and a slice of pie for dessert. There is nothing difficult about it and it will last for days in the refrigerator. I have seen crock pot recipes for corn chowder but I don’t think most cream based soups benefit from long cooking times. This can be made in 30-40 minutes and will be fresh and flavorful when you serve it. Be sure to cook the flour and butter mixture for several minutes or you will end up with a raw flour taste in your soup. This is the single most common mistake that people make with cream soups. 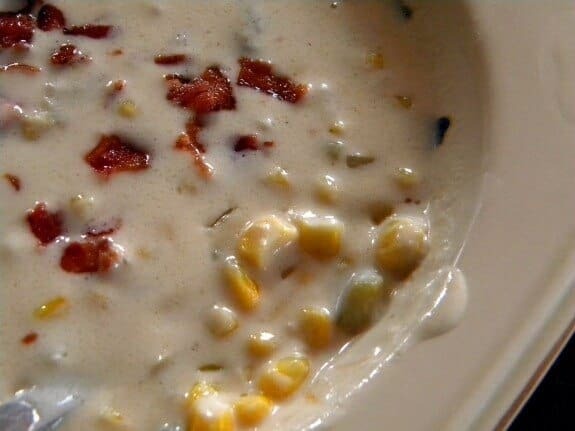 Creamy corn chowder with a southwestern kick is the perfect comfort food to help you transition from summer to fall... or any other time you just want something good. Cook bacon in a large stockpot until it is crisp. Remove it from pan and set aside. Cook garlic, onions, and red pepper in the bacon grease until the vegetables are transparent. Melt the butter in the bacon grease. Whisk in the flour and cook over medium heat for 3 minutes or so, stirring constantly - don’t allow it to brown or burn. Cook until mixture begins to thicken. Remove 2 cups of the corn/milk mixture and blend in a blender until smooth. Add back to milk and corn mixture in pan. Add the bacon, onion mixture, potatoes and chiles. Simmer until thick and heated through. the editors disdain for your food being southwest … is well… duh! What did they think ??? You were working on a southwest cookbook … right ??? And… the recipes were supposed to be unique – and yours ??? Hello … that IS what you do! sorry that contract got cancelled – but that was probably a blessing in disguise based on the editor you were working with! LOL! It was not a southwestern cookbook per se, and honestly there were not just southwestern recipes in there. Ah well. Excellent, Marye! I will definitely try it this weekend. It will be a nice change from the New England Clam Chowder I make so often. Thanks!